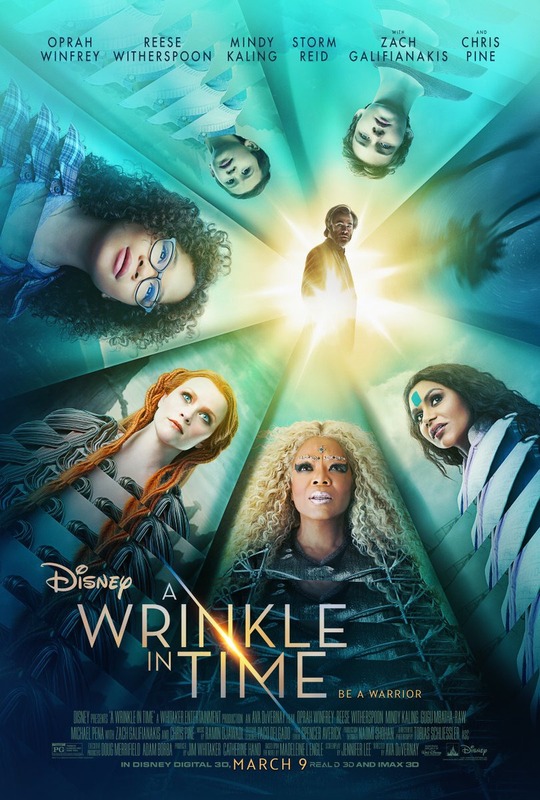 Movie: "A Wrinkle in Time"
A young girl, her friend, and her little brother travel with three universal entities across time and space to find her father, who is lost somewhere in the universe. We have been looking forward to "A Wrinkle in Time" for quite a while now. Sometimes, anticipation is a good thing, and other times, that can only lead to disappointment. This film is directed by the wonderful Ava DuVernay, who is best known for directing "Selma" and the Oscar-nominated documentary "13th." It is written by Jennifer Lee and Jeff Stockwell and is adapted from the 1962 novel of the same name by Madeleine L'Engle. It stars Storm Reid as a young teenager named Meg Murry. Her father (Chris Pine) has been missing for four years. He was working on a theory that would allow someone to travel across space and through time using only their mind. He vanished when using his discovery for the first time, heading to a faraway place with no hope of ever returning. It turns out, Mr. Murry is in trouble and is lost in the universe. Now, three universal entities, Mrs. Who (Mindy Kaling), Mrs. Whatsit (Reese Witherspoon), and Mrs. Which (Opera Winfrey) have come to look for Meg and her genius brother Charles Wallace (Deric McCabe) and their friend Calvin (Levi Miller) to help them go on an adventure to find Mr. Murry. Also in the film is Gugu M'batha-Raw, though she really doesn't get much to do and is pretty much relegated to two scenes at the beginning and end. "A Wrinkle in Time" is a classic story, one BigJ grew up reading. I, on the other hand, was not super familiar with the story but sure loved the trailers for this film. It is a tale that combines science and fantasy and tries to show the importance of both. It also attempts to explore the importance and value of love as well. The message of the movie is very focused on the 'importance of love' aspect. It details how toxic hate and anger can be, and we're all for spreading this well-intentioned message to kids because it's the absolute truth and needs to be said more often. The visuals are beautiful, especially the costume designs of the three Mrs. They are bright, colorful, glittery, fantastical, and vibrant, just like the movie itself. That being said, the constant continuation of this bold color palette sacrifices both atmosphere and mood because it feels very one-note when it comes to its visual tone and has little variation from place to place. Even the scenes in the dark world of Camazotz feel this way. It's clear to us that director Ava DuVernay had a lot of dazzling effects and visual intricacies that she wanted to include here, but she forfeited a lot in the way of storytelling to get her ultimate final product. Flashy make-up and interesting visuals don't make a movie great, unfortunately. The narrative is a problem as there is no clear thread from beginning to end. It's borderline incoherent at times. Most of the dialogue is expository and explains who or what things are and where they go and how they got there. Some scenes feel like they don't even belong in the first place. There are a couple big action moments that feel superfluous and serve little purpose other than adding a big action sequence because there needed to be more pomp and circumstance. Finally, as everything was wrapping up, we couldn't help but feel underwhelmed by its ending. It feels unearned. Again, for a story about the importance and value of love and self-love, it doesn't have the emotional impact that we hoped for. It's actually amazing how a movie this splashy and vivid with such a pervasive message about love can feel so emotionally flat. We feel "A Wrinkle in Time" had all the ingredients to be something special and it just didn't come together. We were very disappointed with the final product.